Steins;Gate 0 comes out of its one-week break between Spring and Summer with authority, delivering a tantalizing blend of drama, tension, and purpose. Roughly half a year has passed since a brainwashed Kagari was taken by forces unknown, which means we’re already at a point where the likes of Rintarou and Mayuri have reached the “acceptance” phase of loss. There was a time when he’d search endlessly and fruitlessly, but absent clues or recourse…life goes on. 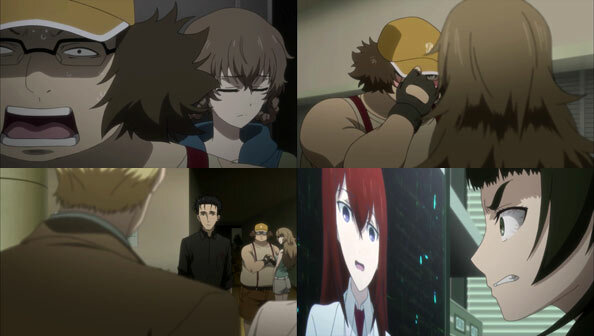 In Rintarou’s case, “life going on” means continuing not to pursue any kind of objectives relating to time travel, which means Suzuha and Daru are on their own. 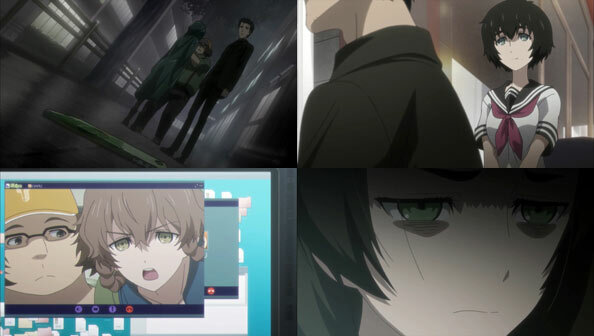 While Daru has made some progress, he’s still far from restoring the Phone Microwave, which prompts Suzu to reach out to Maho (back in America) for her assistance and scientific know-how. The only problem is, a sleep-deprived Maho continues to suffer from her Salieri complex: even if she has the ability to repeat what “Mozart” accomplished in another world line, she lacks the confidence to implement it. She doesn’t agree to assist Suzu because she’s afraid she’ll fail; she’ll let everyone down where Kurisu wouldn’t. Word comes that Fubuki is in the hospital again; Suzu makes her dad Daru use it as another opportunity to interact with her mother (worried she may never be born in the future). Thankfully, it’s a false alarm; the doctors simply wanted to run more tests on Fubuki…though I wonder whether this is some kind of foreshadowing for further ill effects of time travel. While at the hospital, Rintarou meets Dr. Leskinen, who doesn’t hesitate to take several pictures of their encounter for the benefit of Maho. Daru learns for the first time that Rintarou may be bound for America to study and eventually join Leskinen’s research group, but Leskinen made sure not to set a concrete date for Rintarou to do so. Suzuha finds Kagari’s metal opa in the hallway outside the lab, which is strange, because there’s no way she nor anyone else wouldn’t have noticed it for half a year; it must have been left there on purpose. Sure enough, Suzu pretends to be in the shower when an uninvited guest helps herself inside the lab. 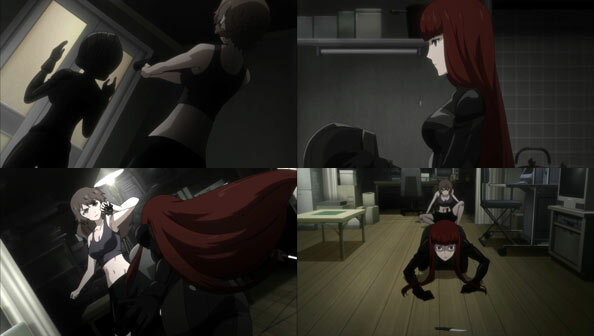 Suzu, unquestionably the most militarily capable of Rintarou’s circle of friends (not counting Tennouji) gets the jump on the helmeted intruder in black, and when she forces her to take off her helmet, it’s revealed to be Kagari, or rather a fully-brainwashed Kagari in “Bureau Mode.” She’s come for her Opa, and when Suzu doesn’t produce it, Kagari goes mad and attacks. Kagari isn’t too much of a challenge to Suzu, until Daru shows up and Kagari slashes Suzu across the abdomen. Kagari snatches up the Opa and flees, and Suzu isn’t able to catch up to her. But as she fled, Daru noticed Kagari was crying. Their Kagari is still in there, somewhere, and she needs their help. But if what Suzu suspects is true, they can’t help her without a time machine. Suzu also notes that Kagari mentioned she “heard the voice of God” both in the present and twelve years ago when she held her up with a gun. She goes on to believe Kagari, like so many of her “Valkyrie comrades”, is the victim of the “Bureau’s Professor,” who thankfully doesn’t look much like Leskinen (from what little we see of him). Suzu and Daru beseech Maho via “Skipe” one more time to assist them in building a time leap machine; Maho can tell they’re more desperate than before, yet still doubts herself. But after looking at Amakurisu, something clicks in her head, and she starts packing for Japan. 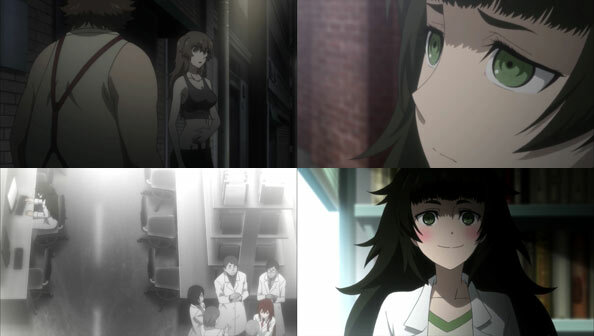 Rather than searching Kurisu’s work for all the answers, Maho intends to go down the same path and reach the answers herself. After all, no one acknowledged and valued Mozart’s talent more than Salieri. If anyone can do what Kurisu did when it comes to time travel technology, it’s Maho. I’m glad she finally realizes that.